At bottom left corner, signed and dated "VG 1653" in black chalk. Markings: At bottom left corner, collection mark of Defer-Dumesnil (L.739); at bottom right corner, collection mark of Marius Paulme (L.1910). 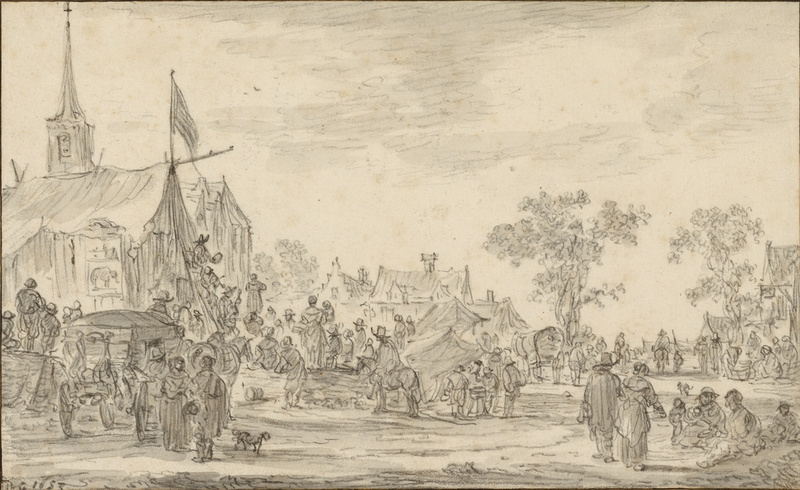 With energetic and varied strokes of black chalk, Jan van Goyen described a crowded village festival. A large tent has been erected in front of the church on the left and hung with a flag. On a raised platform in front of it, three musicians play the fiddle and tambourine while townsfolk sit and listen. A covered carriage draws up to the scene, and a couple greets the new arrivals. In the center of the field, two other stalls provide shelter for those selling their wares. Van Goyen took full advantage of the diverse action to create a lively and entertaining composition. Peasant sellers and elegant and ordinary shoppers alike discuss and examine the varied goods for sale. Using fluid strokes, van Goyen suggested people's faces with circles and the outlines of buildings, animals, and foliage with rapid, vivid lines. Van Goyen frequently traveled about the Netherlands as a picture dealer, valuer, and speculator in tulip bulbs, land, and houses. Based on the sights he had seen on his trips, he made many elaborate drawings like this one in his studio.